The film opens with those farmers, one of whom overhears bandits planning an autumn attack. Panicked, he returns to the other villagers and they agree to hire samurai to protect them. Here, what is probably the central theme of the movie is set in motion: the contrasts between different types of people, and how these contrasts must be dealt with. The tensions between the frightened, petty villagers and the professional, cool samurai is a case in point. Yet even amongst the samurai there are contrasts: each of the warriors is specific, as unique as each of the seven dwarfs (one or two get a bit lost in the shuffle, but at least four have very distinct personalities). There is no harmonizing aspect here, which might be one reason the film is so popular in the west and has been seen as “too western” by many Japanese critics. Out of these disparate units, Kurosawa does not mold a whole – the different parts come together to form a fighting unit, but in the end they dissolve and even at the height of action, each component remains distinct, serving its own purpose in the overall battle. Throughout Seven Samurai, Kurosawa preaches unity but he practices diversity; he proclaims the value and necessity of the community yet draws our attention to the intricacies of the individual. Seen in twenty-first century America, I find the interplay of values compelling and rewarding. Today we tend to narrowly slice off and polarize different senses of virtue: for the conservative, pure individualism (at least economically); for the liberal, the values of the community. Seven Samurai would seem to follow the latter path (albeit within a traditional template, making the adjective “liberal” seem rather misplaced) yet at its heart is an entrepreneurial bargain – a matter of free association, for the common good sure, but with a sense of disciplined managerial skills that fits the conservative mindset. Here is where each of the seven samurai come into play, representing different motivations and aspirations. For Kikuchiyo and Katsushiro, the bargain is one of self-interest. Both want to prove themselves brave samurai, one because he resents his peasant upbringing and has violent energies he wants to channel, the other because he is young and idealistic, desiring to become a warrior like those he admires. For the other samurai, the motivation is a bit more ambiguous – some seem bored with their lot chopping wood or looking for work. For Kyuzo, the silent but deadly type, and Kambei, the wise older leader, it is simply a matter of duty. They are samurai; this is what they do. Even there, there’s a difference: Kyuzo wants to practice and sharpen his skills, while Kambei seems more bound by moral duty. With the motley motivations, the samurai themselves display the tensions in the film at large. As Ebert notes in his review of the film, Kurosawa’s “purpose was to make a samurai movie that was anchored in ancient Japanese culture, and yet argued for a flexible humanism in place of rigid traditions.” This is an excellent and succinct summary, although I sense a bit more ambiguity in Kurosawa’s purpose (or at least the results that purpose achieves): the humanism is subject to discipline, and I’m not entirely sure the ending deplores those rigid traditions. It seems more resigned to their existence (in this case, the division of social roles – the farmers in their place, the samurai in theirs). Put another way, the samurai world opens up to include outsiders but it’s sort of a one-way trap – once in, you can’t go out. The farmers can accommodate the samurai when they need them, but afterwards there seems to be no place for the samurai in the community. Ultimately, the film is a celebration of “the project.” The project could be anything – a harvest, a jewel heist, a war, even a film production. In the project, individuals are allowed both to express and challenge themselves while also finding a larger purpose. Onscreen, the project is protecting the village from the marauding outsiders. The movie has a nominally “happy” ending in that the bandits are defeated, but four samurai are killed, the survivors seem lost and confused, and the villagers, while momentarily content in their harvest, have been said and shown to be miserable in their day-to-day lives. 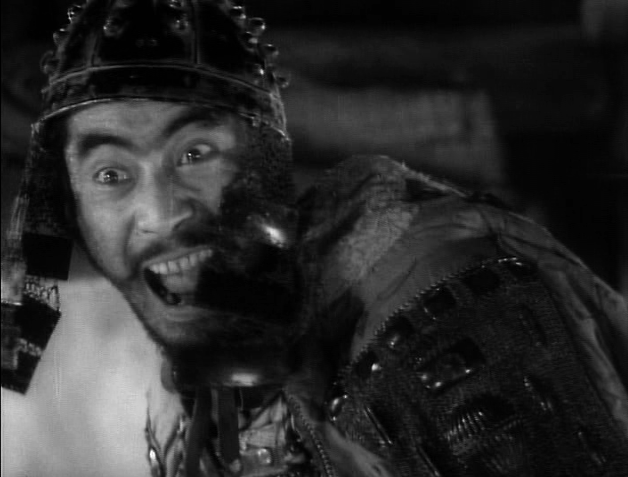 All of the film’s speeches reinforce this sense of life as difficult, unpleasant, frustrating, whether one is a bandit, a samurai, or a villager (one of the more humorous moments sees Kikuchiyo sneak behind enemy lines to confer with an unhappy bandit, who complains of his misery which Kikuchiyo, before killing him, promises will soon be over). Yet in the execution of their plan, fraught as it is with danger and anxiety, there is a heightened sense of fulfillment. Though the movie may be seen as an individualist, humanist parable, and in some senses it is, it’s also consistent with the tradition of sacrificing oneself for a higher purpose, and finding bliss in the process. What separates Seven Samurai from earlier myths of this sort is its pointed ambivalence and clear-eyed view of how short-lived the greater project always is, indeed how short-lived it must be. It relies for its very existence on being exceptional, a departure from the norm. And of course, these great projects are fraught with horror: full of bloodshed and anguish, yet somehow the overwhelming quality of these emotions – at least as shown onscreen – in tandem with the focused, intense accomplishment of a goal, lends the project a sort of cathartic power. Recently I watched the World War II classic Mrs. Miniver, and it serves as an interesting juxtaposition with Seven Samurai. There, the war is seen as something that must be endured, and the characters’ achievement lies in holding onto the spirit of peacetime amidst the perils of total war. There is a surreal quality to the movie, as the tidy bourgeois world is invaded by wounded Germans, ferocious bombardments, and propagandistic radio assaults. The movie was designed for American audiences, for whom this war-on-the-homefront notion was foreign and strange (the last war fought on U.S. soil was the Civil War). What seemed important was upholding the happy world of peacetime. 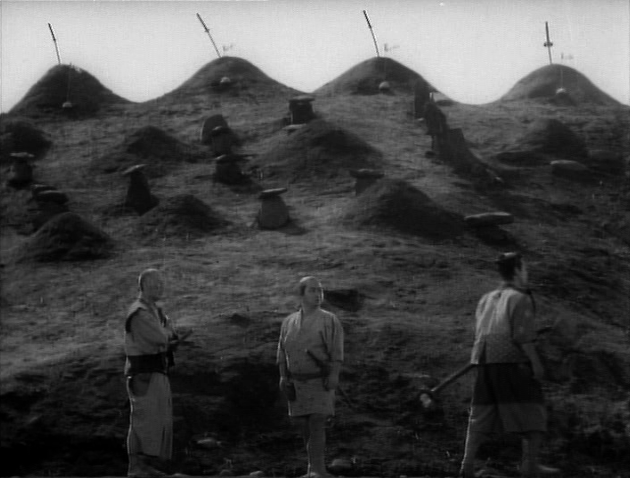 But in Seven Samurai, the world of peacetime is not seen as very happy, or very peaceful. In fact, to be entirely accurate, it doesn’t exist – even if the village is momentarily spared, a great civil war is raging across the land; so the idea of an assault is less strange than the idea of peace. In a world where total war is the norm, happiness is to be found not in preserving a myth of blissful nonchalance but in embracing the war spirit wholeheartedly, throwing oneself into the maelstrom, while clinging onto the staff of discipline by which one orients oneself. And only there can a sort of satisfaction and purpose be found. In that sense, the only ones who get a happy ending are the four souls beneath those burial mounds at film’s end, swords still standing defiantly upon the dirt while others look about them, wondering what to do next.